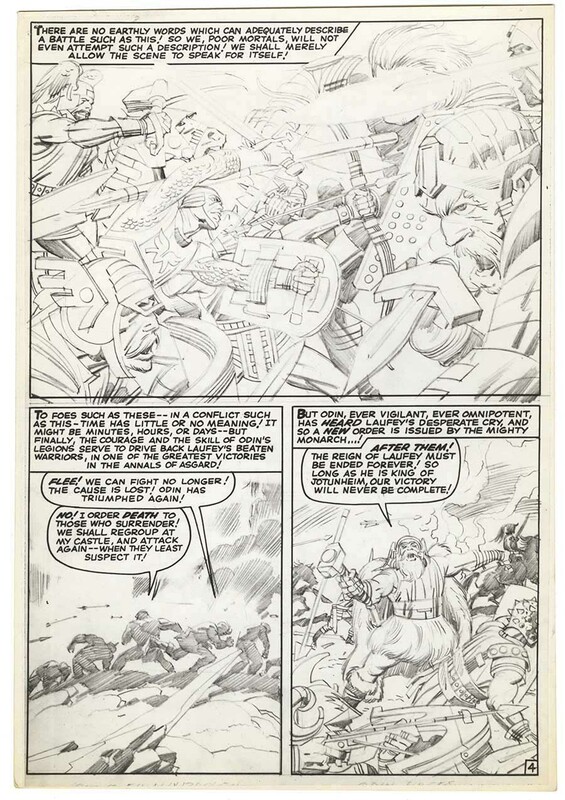 Some wonderfully clear stat camera photographs of Kirby’s pencils recently appeared on Tom Kraft’s What If Kirby site. They were all Thor pages from the mid 1960’s. 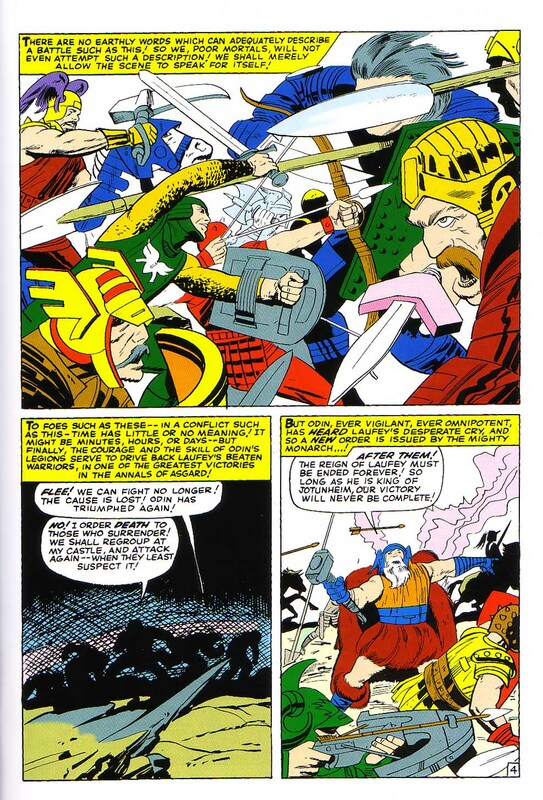 The first displayed here is from the Tales of Asgard feature in Journey Into Mystery #112, the third page of The Coming of Loki. 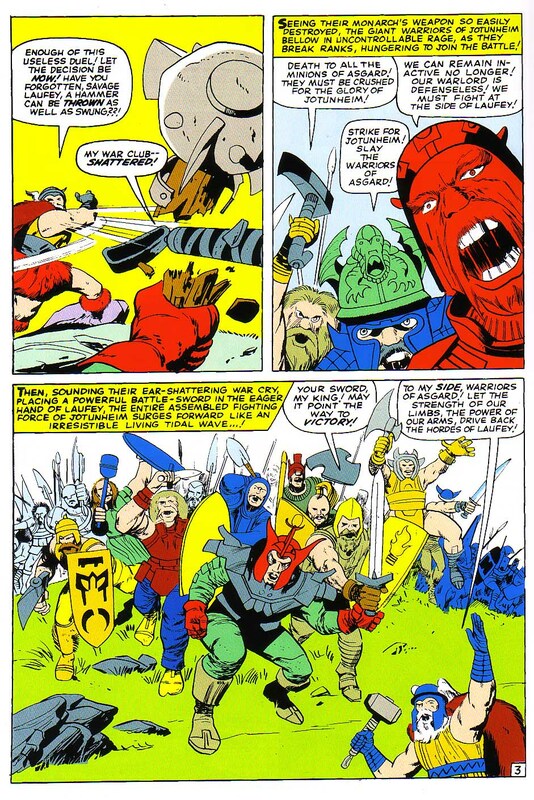 I am often a defender of Vince Colletta’s style on Thor, because of his archaic feathering look, but one look at these pencils shows me just how little of Kirby’s nuanced line Colletta actually reproduces here with any accuracy. Compare in particular, the difference in the subtleties of the pencil-sculpted shapes in the legs, both in fabric and sinew to the inked version. Colletta doesn’t even begin to ink the actual pencil line, but blunts and deadens the fluidity of its intent. The figures in the background suffer most grievously. Given, this is a complex work of art containing multiple figures, but this important feature certainly should have been given the attention that it deserved. The following page below is a wonderful melee of fairly close figures coming together from two directions. The circular composition brings the eye around and around in a spiral as we first see the action on the boundaries and gradually work our way to the center and the leftward thrusting shield. The inked version of the large panel is OK for the most part, although it isn’t as sharp as it could be. However, the second and third panels are an abomination. Look at the subtle shaping and shading of the shadowed figures in panel two, and see how Colletta has totally blacked them out and obscured any of their subtleties. And what the hell has he done to the space above the figures that Kirby has modeled with cloud formations? How can you justify this mass of grotesque crosshatching and solid black that the inker has imposed over a powerful composition. Colletta’s inked third panel is nearly as bad. In the penciled version. Odin’s figure and the space that he inhabits is a wondrous tableaux in miniature, and could stand on its own as a splash panel for its complex composition of figures in battle. From the archer at its base, to the shaded horseman and dramatic sky it seethes with power. Colletta reduces all of this splendor to dross. Odin’s face, torso and limbs are treated with the contempt of the inker barely following the intent of the line work. The horse is of course almost completely blacked over. The majesty of the sky is scribbled as an incompetent child might do. What one sees most clearly in these pencils is how the slightest deviation from the precision of Kirby’s line can substantially nullify its force. One sees this even in the case of a fairly faithful inker like Chic Stone or Joe Sinnott. 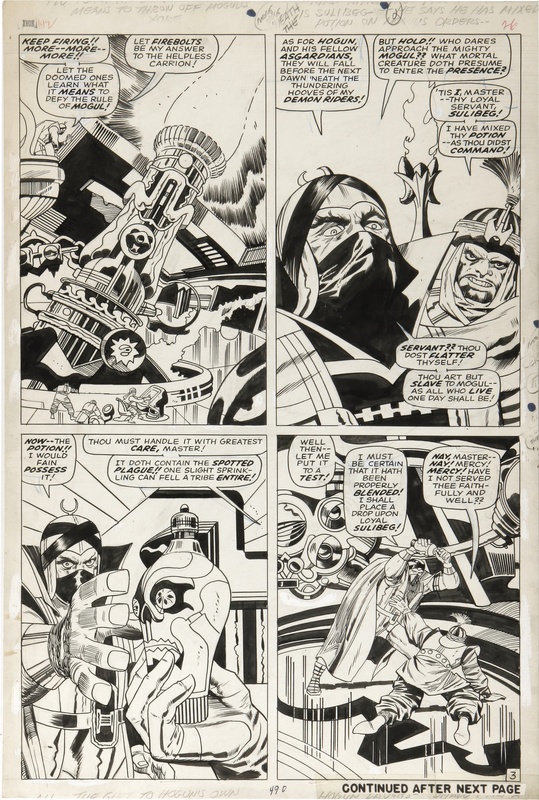 Certainly, there have been instances when Colletta’s pen or brush did justice to Kirby’s pencils. 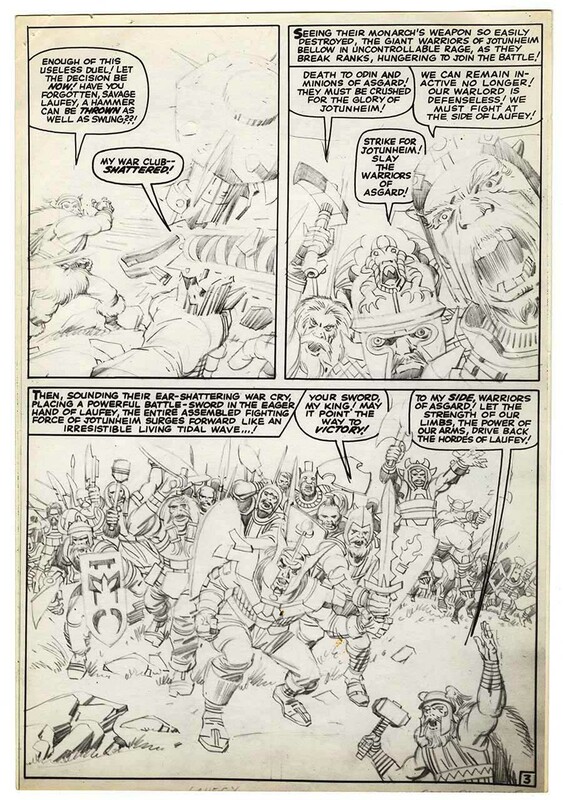 One need only look at the beauty of his brushwork on this Thor #142 page below to see that the man had serious chops. Why is his work then so inconsistent. Perhaps Colletta was giving some of his work to assistants to complete, due to the pressure of deadlines. Still, this is no excuse to have so severely compromised some of the most compelling comics ever produced. One can only be grateful for pencil copies such as these that Tom has compiled, to know what might have been. Pity there isn’t more out there.